The forehead lift or brow lift is usually performed simultaneously with the facelift or it can be done alone. The procedure is aimed at raising the level of drooping eyebrows, which widens the eyes and gives a more pleasant and youthful appearance. An elegant, natural eye/eyebrow unit is the goal. The “surprised look” is avoided at all cost. 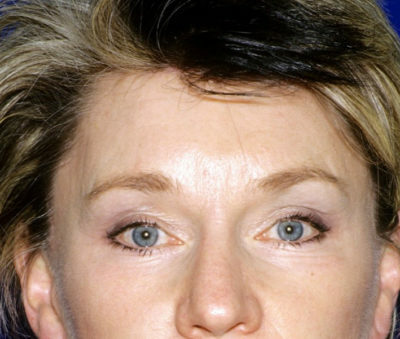 Drooping of the eyebrow, or hooding is frequently one of the first signs of aging and usually begins around age 40. The condition is often overlooked because most people are unaware of the problem and the degree of improvement its correction can provide. Drooping eyebrows give the appearance of being tired and angry. It also causes a redundancy of the upper eyelid. If you were to stand in front of a mirror and with your fingers raise each eyebrow simultaneously about 1/2 inch you would see the typical correction from a forehead lift. It would help open the eyes, remove the upper eyelid bagginess and also help remove the “crow’s feet” wrinkles on the corners of each eye. Typically the vertical midline forehead wrinkle can be improved by this procedure as well. Using several small incisions, the scalp is mobilized, “slid” back and fixed into position. This procedure is desirable in those patient’s with medium to low hairlines who have only a small amount of brow laxity. 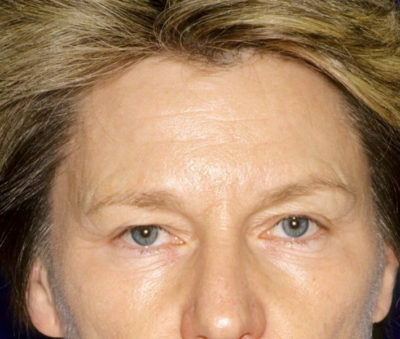 The endoscopic forehead lift does raise the hairline slightly but scars are well hidden. In this procedure, the incision is placed at the hairline. The scar eventually becomes hidden in the hair. This procedure raises the brows and forehead as a unit; keeping the same general brow shape and configuration and returning them to their original position before gravity and stretching took place. The vertical midline forehead crease is also easily addressed during the operation. Advantages are a hidden scar, an improved forehead/brow complex and no change in forehead height. The oldest form of forehead lift. The incision is placed behind the hairline and excess skin is excised. This procedure is good for those patient’s with medium to low hairlines. The incision is not at all visible, however, the brows are raised in the same shape and configuration. This procedure raises the brows by making an incision in a horizontal forehead wrinkle and adjusting the brow to the exact position desired. Usually performed on men whose wrinkles are prominent, this procedure is indicated for some women who, for instance, have a high hairline, or who have forehead lines and prefer this method. With a direct brow lift, there is less post-operative care, the procedure is less time consuming and the brows can be set in the exact position desired. The procedure has a very good result, however, it is not performed on those who cannot tolerate a wound on the forehead. With a little patience, most patients find that the forehead scars are imperceptible within months and can be totally camouflaged with makeup. Incisions are made in the temple areas behind the hairline in order to raise the outer brow/forehead areas. The procedure is performed under sedation and scars are well hidden. The temporal lift is good for those patients with only limited brow droop. Neither the direct brow lift nor the forehead lift will remove bulging fat from the eyelids, nor will they totally correct deep lines already present. A chemical peel or laser skin resurfacing may be necessary to smooth these lines. These procedures are often performed in conjunction with blepharoplasty surgeries.